Every day I check my Amazon associates account. And every day I see new money I’ve made overnight. You see, a few years ago I put together a little website which promoted a single Amazon product. That one website with only one product on it has made me $3444.45 in commissions. I built that site and haven’t touched it since. But can you imagine the moola I could have brought in if I created more of those sites? I had to create the content. I had to create the images. Hell, I even had to code the entire site myself. (I shudder just thinking of it). But times have changed and you don’t have to go through all that torture to earn big Amazon paychecks anymore. You can now create a fully functional Amazon website in only 60 seconds. I’m not s**tting you. You can quickly and easily create your very own website with a new software called Instant Azon. All you have to do is hit a few keys on your computer keyboard and voila… Instant money-making website. No hard work for you because this software does all the work for you. Plus, you won’t have just one Amazon product on your site like I have. You can have a dozen on there if you want. 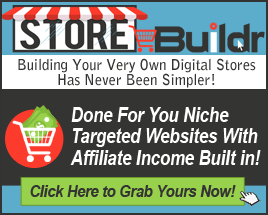 And since these sites are so easy to build, you can create as many sites as you want. But you need to act quickly on this because this special page for this software and the “advertise your site on my blog for an entire year for free” bonus are going to be pulled offline soon.